That?s because these were the stories that no one else could write. 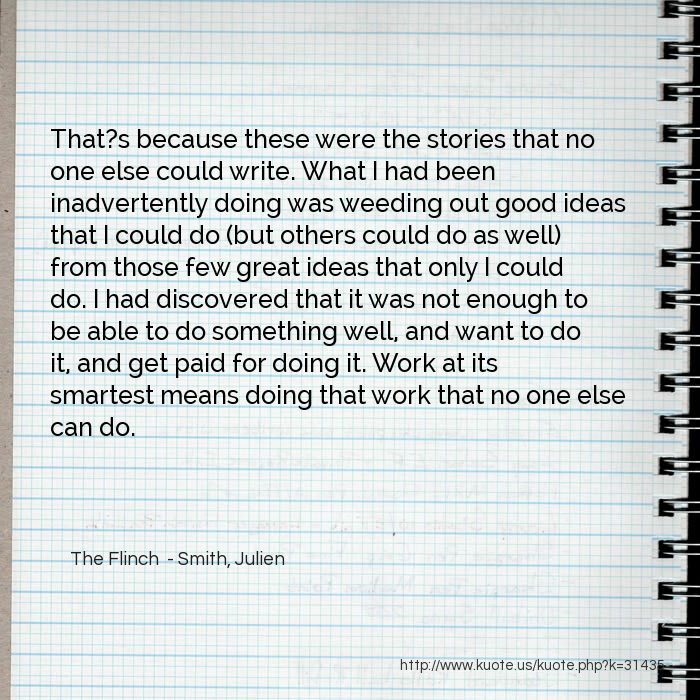 What I had been inadvertently doing was weeding out good ideas that I could do (but others could do as well) from those few great ideas that only I could do. 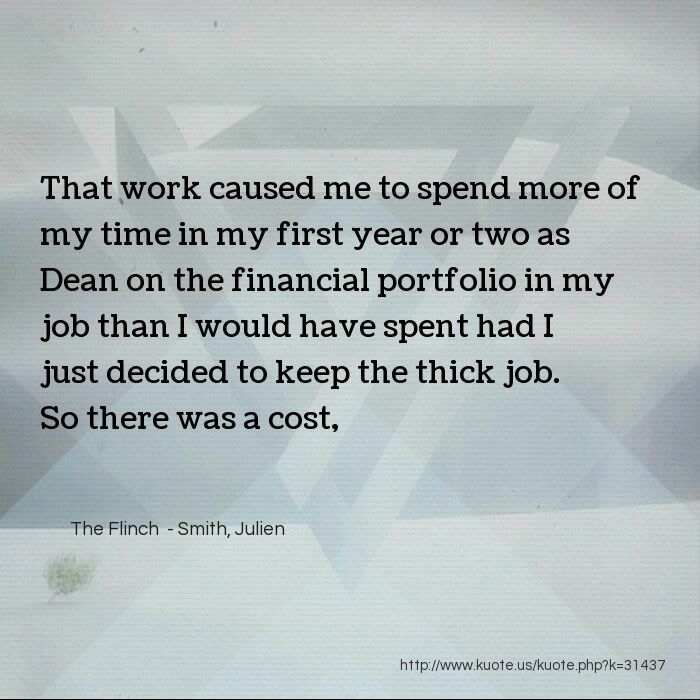 I had discovered that it was not enough to be able to do something well, and want to do it, and get paid for doing it. 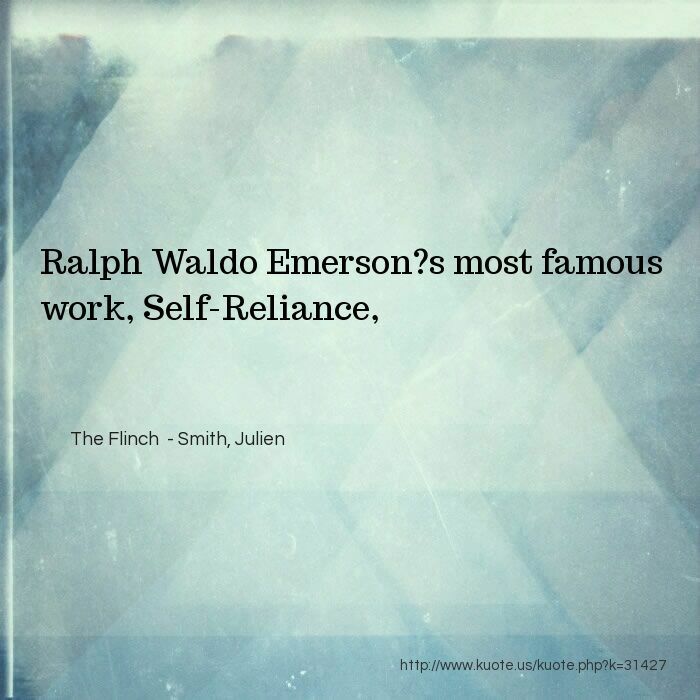 Work at its smartest means doing that work that no one else can do. 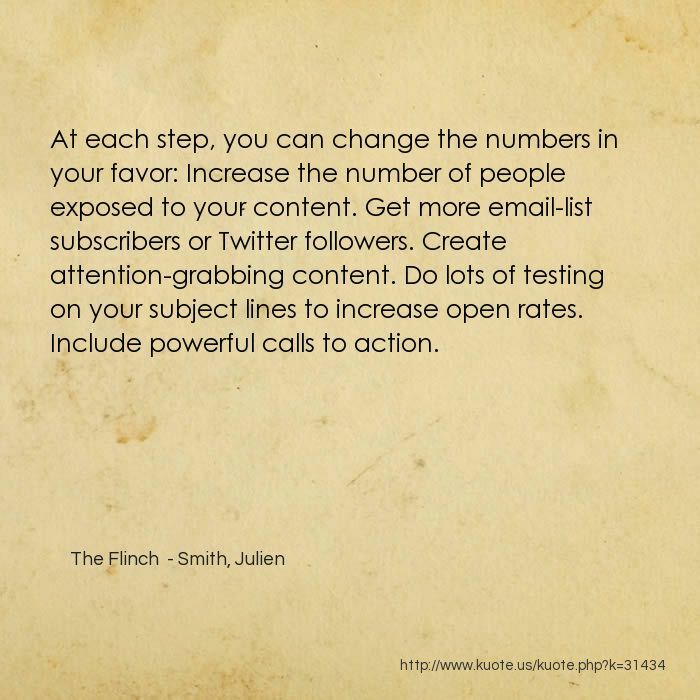 At each step, you can change the numbers in your favor: Increase the number of people exposed to your content. Get more email-list subscribers or Twitter followers. Create attention-grabbing content. Do lots of testing on your subject lines to increase open rates. Include powerful calls to action. The person must be exposed to your content. This means that the person has to be following you on Twitter, be a fan of your page on Facebook, subscribe to your email list, and so on. 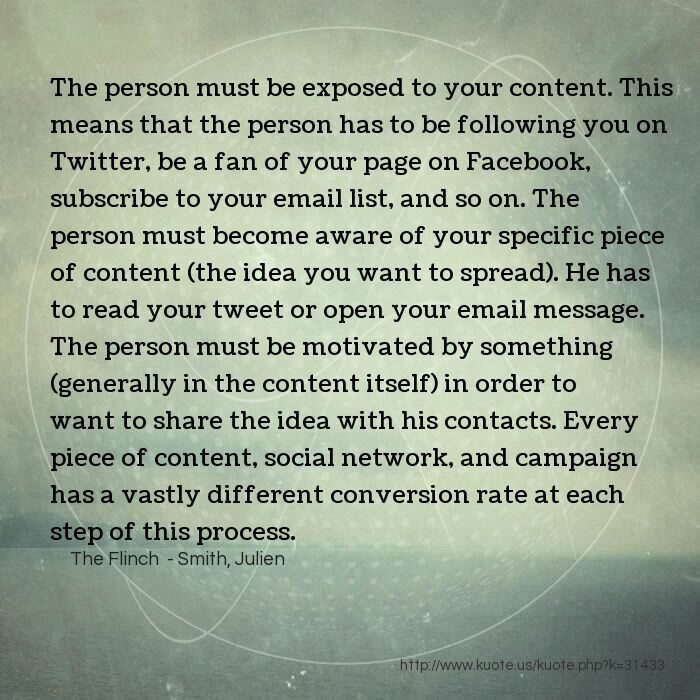 The person must become aware of your specific piece of content (the idea you want to spread). He has to read your tweet or open your email message. 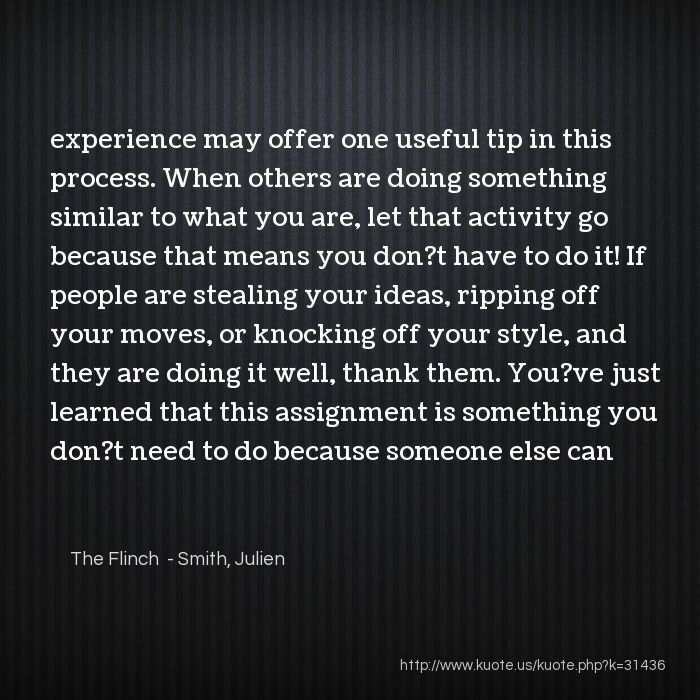 The person must be motivated by something (generally in the content itself) in order to want to share the idea with his contacts. Every piece of content, social network, and campaign has a vastly different conversion rate at each step of this process. 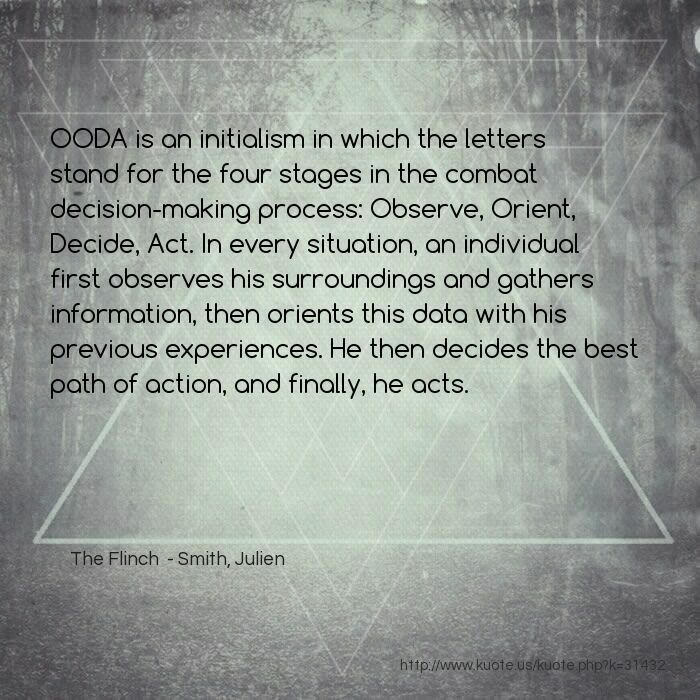 OODA is an initialism in which the letters stand for the four stages in the combat decision-making process: Observe, Orient, Decide, Act. 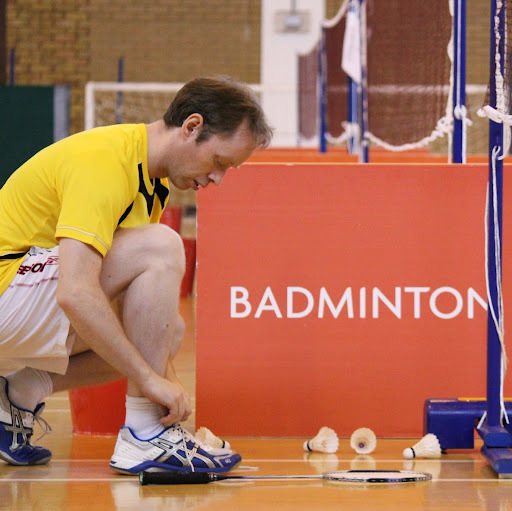 In every situation, an individual first observes his surroundings and gathers information, then orients this data with his previous experiences. He then decides the best path of action, and finally, he acts. Business is not about money. It?s about making dreams come true for others and for yourself. Making a company is a great way to improve the world while improving yourself. When you make a company, you make a utopia. It?s where you design your perfect world. Never do anything just for the money. 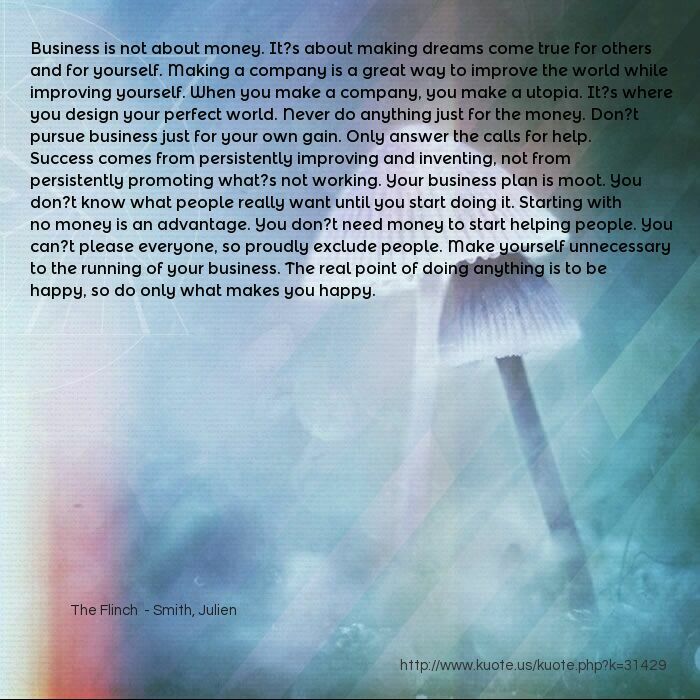 Don?t pursue business just for your own gain. Only answer the calls for help. Success comes from persistently improving and inventing, not from persistently promoting what?s not working. Your business plan is moot. You don?t know what people really want until you start doing it. Starting with no money is an advantage. You don?t need money to start helping people. You can?t please everyone, so proudly exclude people. Make yourself unnecessary to the running of your business. The real point of doing anything is to be happy, so do only what makes you happy. abide by our spontaneous impression with good-humored inflexibility then most when the whole cry of voices is on the other side. 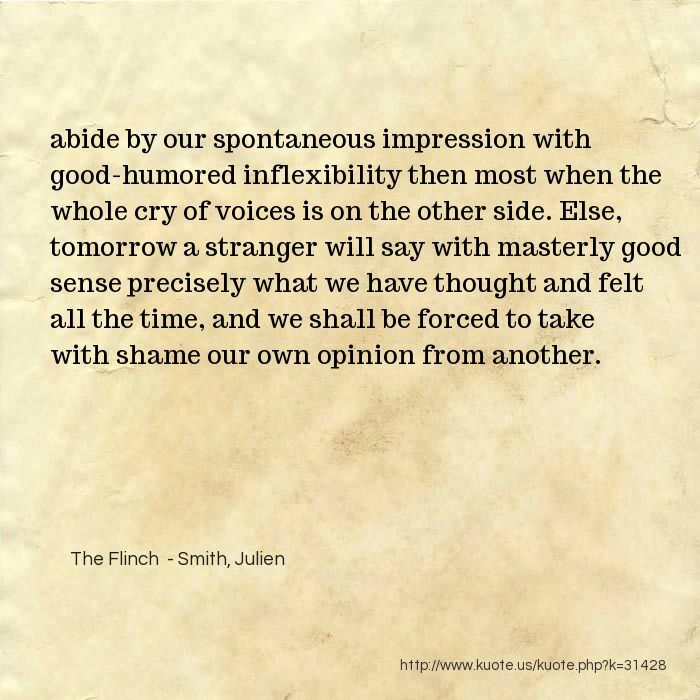 Else, tomorrow a stranger will say with masterly good sense precisely what we have thought and felt all the time, and we shall be forced to take with shame our own opinion from another. 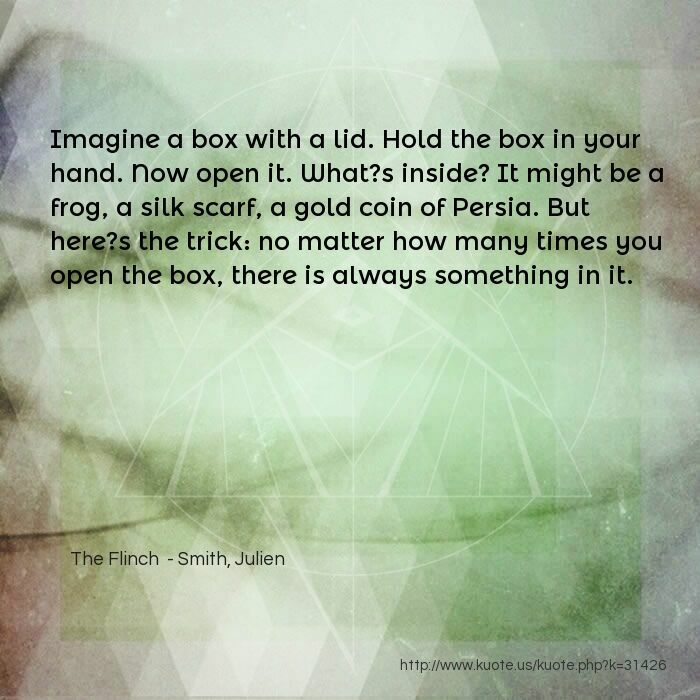 Imagine a box with a lid. Hold the box in your hand. Now open it. What?s inside? It might be a frog, a silk scarf, a gold coin of Persia. But here?s the trick: no matter how many times you open the box, there is always something in it. 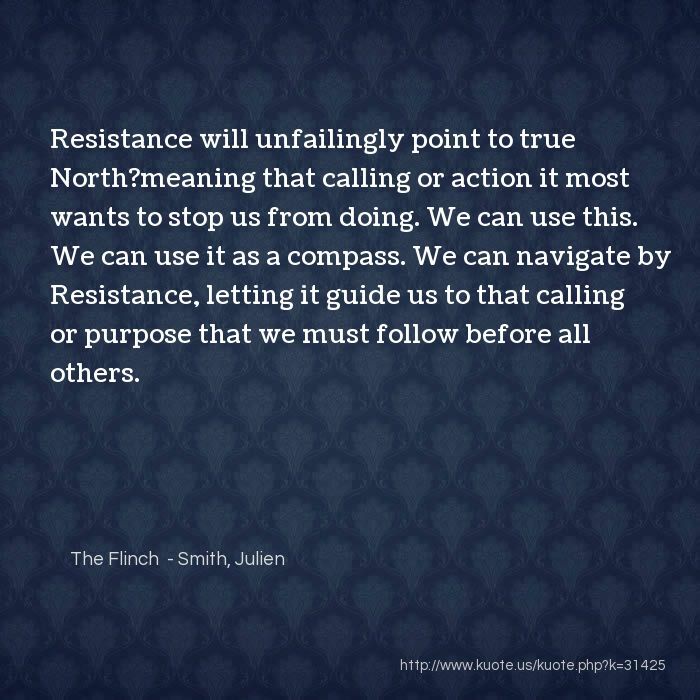 Resistance will unfailingly point to true North?meaning that calling or action it most wants to stop us from doing. We can use this. We can use it as a compass. We can navigate by Resistance, letting it guide us to that calling or purpose that we must follow before all others. 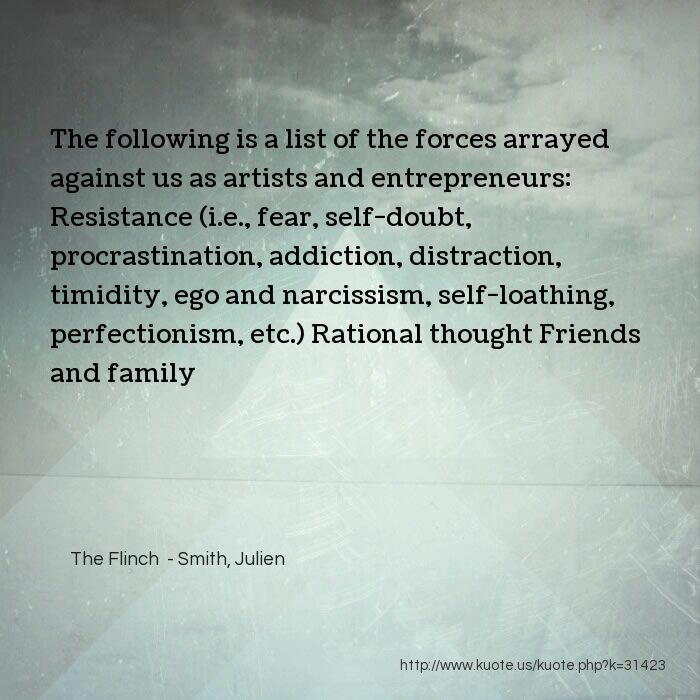 The following is a list, in no particular order, of those activities that most commonly elicit Resistance: The pursuit of any calling in writing, painting, music, film, dance, or any creative art, however marginal or unconventional. 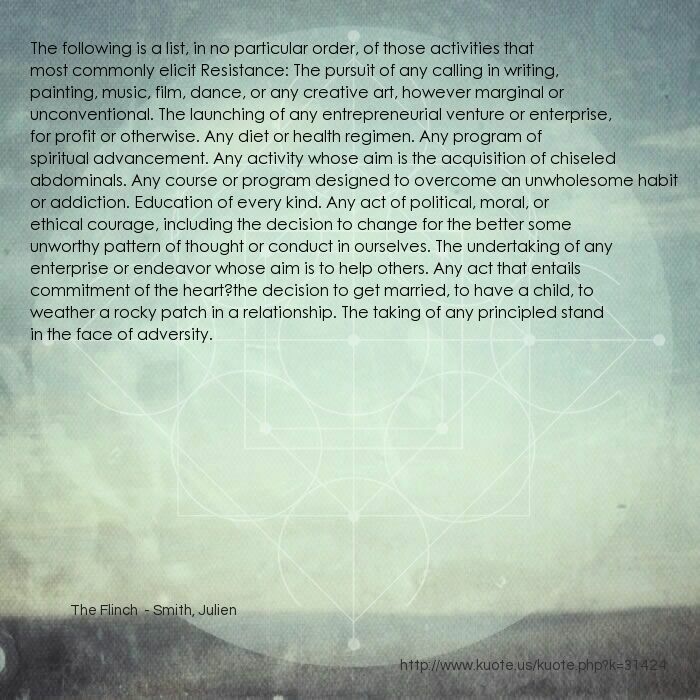 The launching of any entrepreneurial venture or enterprise, for profit or otherwise. Any diet or health regimen. Any program of spiritual advancement. Any activity whose aim is the acquisition of chiseled abdominals. Any course or program designed to overcome an unwholesome habit or addiction. Education of every kind. Any act of political, moral, or ethical courage, including the decision to change for the better some unworthy pattern of thought or conduct in ourselves. The undertaking of any enterprise or endeavor whose aim is to help others. Any act that entails commitment of the heart?the decision to get married, to have a child, to weather a rocky patch in a relationship. The taking of any principled stand in the face of adversity. Flip one switch and a light goes on. Flip both switches and a buzzer sounds. All terrifying, of course, unless you are a kid. 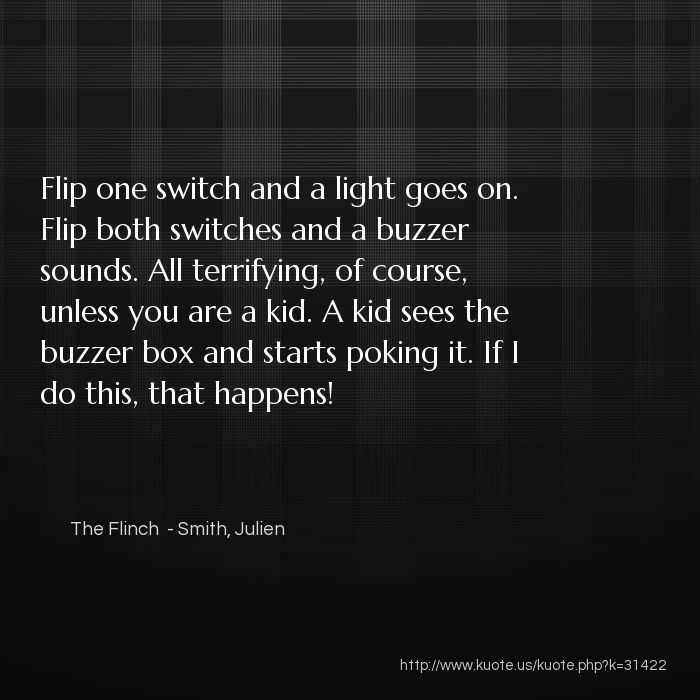 A kid sees the buzzer box and starts poking it. If I do this, that happens! 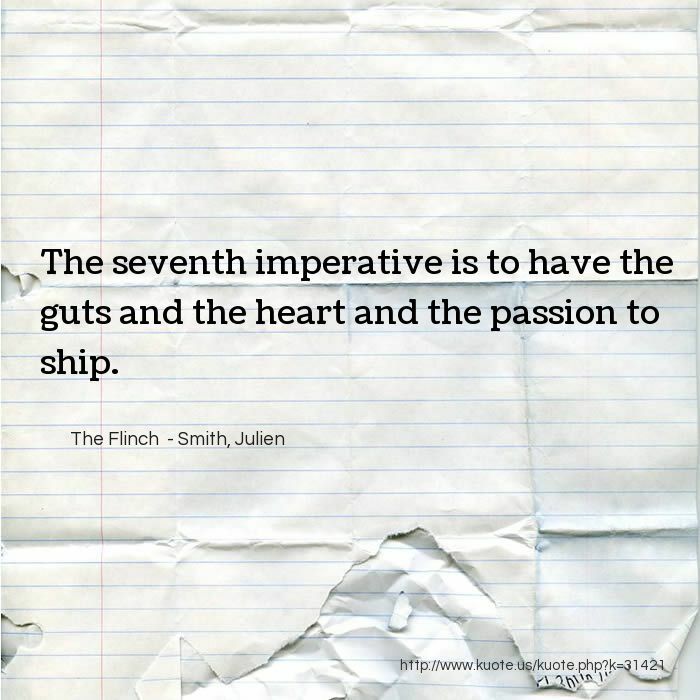 The seventh imperative is to have the guts and the heart and the passion to ship. 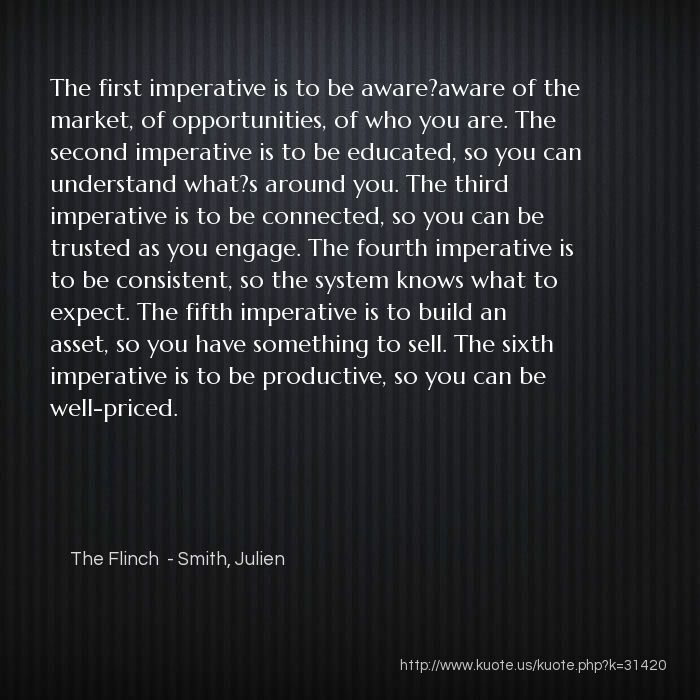 The first imperative is to be aware?aware of the market, of opportunities, of who you are. The second imperative is to be educated, so you can understand what?s around you. The third imperative is to be connected, so you can be trusted as you engage. The fourth imperative is to be consistent, so the system knows what to expect. 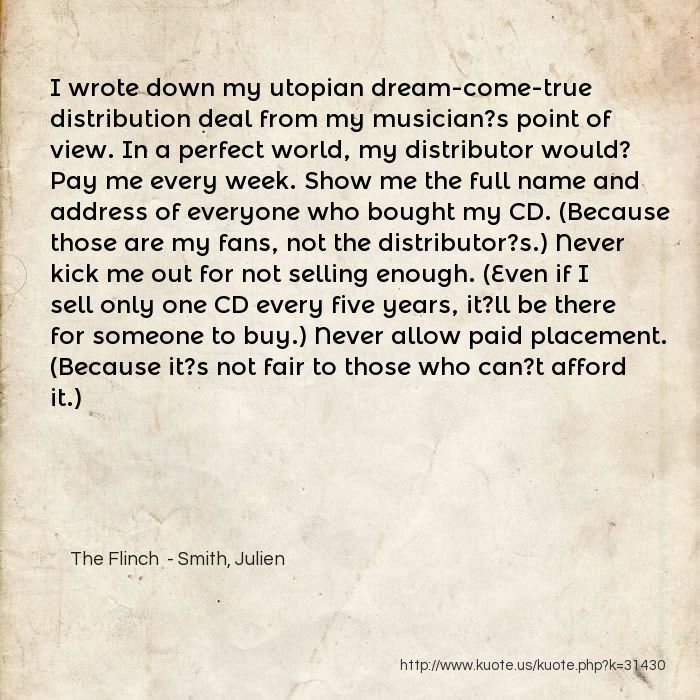 The fifth imperative is to build an asset, so you have something to sell. The sixth imperative is to be productive, so you can be well-priced. 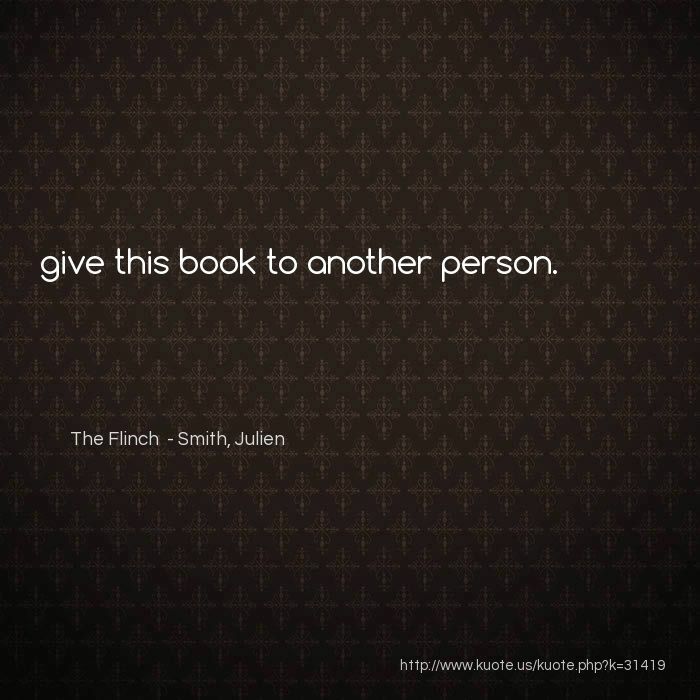 give this book to another person. 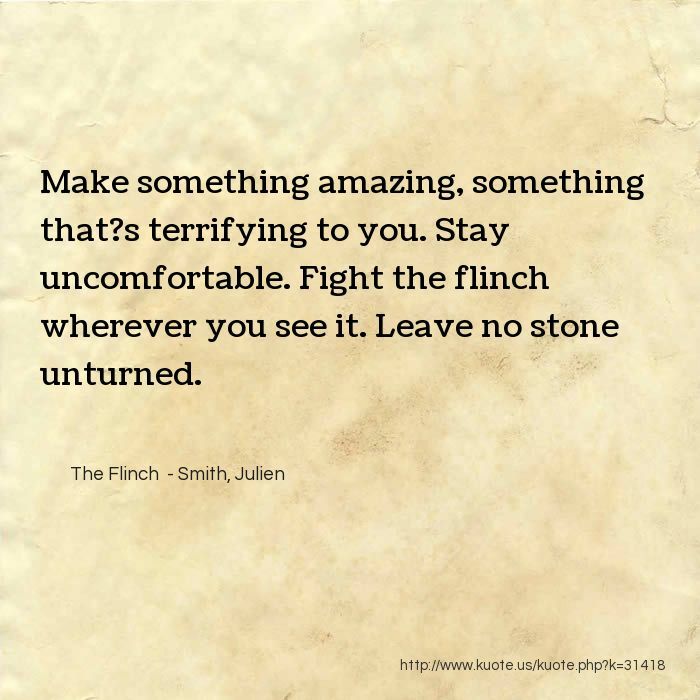 Make something amazing, something that?s terrifying to you. Stay uncomfortable. Fight the flinch wherever you see it. Leave no stone unturned.